In addition to providing compassionate care and administering correct treatments, the Nursing and Midwifery Council Code states that nurses must keep patients and the public safe and free from harm. It sounds simple, but in reality nurses regularly experience situations when they feel the boundaries of safe care are being stretched. The reasons for possible lapses in safety can range from inadequate staffing, skills or training to complex patient needs or faulty equipment. Dealing with such situations can be stressful and time consuming, but ignoring them can be potentially dangerous to patients and to staff as well. 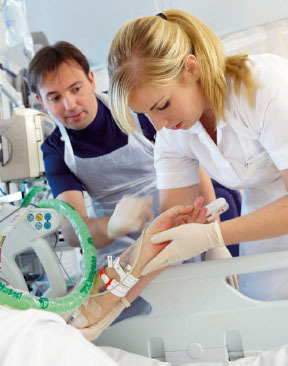 It is essential that nurses develop skills to assertively manage and learn from safety risks. You may want to consider taking a course on assertiveness skills to increase your confidence in handling them. Take account of patient safety, your safety and that of your colleagues. At all times work within the limits of your training and competence. Be open and honest about all aspects of someone’s care, including when mistakes or harm have occurred. Act promptly if you perceive there is risk to patients or public. Report concerns immediately if you believe someone is vulnerable and requires support and/or protection. Work to reduce the risk of any harm/potential harm related to your practice. Offer help in an emergency according to your knowledge and competence. As a registered nurse, you will be responsible for patient safety and wellbeing. This may seem daunting, but there are measures that you can start integrating into your practice, when studying and on placement. Continually reflect on your knowledge and skills and always practise within the limits of your competence, or under registered nurse supervision. If you feel pressure to take on tasks that may be beyond your expertise, remain calm and assertive. Your clinical mentor is there to support you, so do not be afraid to seek advice. Learn to stand back and assess situations objectively. Who is at risk? What safety measures are in place? What else can be done? Ask if you can complete formal risk assessments when in the clinical situation and use these assessments as the basis for reflective accounts. You are part of a wider healthcare team. Don’t hesitate to ask other members for help. If you think that you have made a mistake or had a ‘near miss’, tell the nurse in charge immediately. Remain calm and write down all the facts. If you do not receive the support you need, contact a member of your university team. Familiarise yourself with types of abuse – domestic, physical, emotional and sexual abuse, as well as self-harm – and how they may present in patients from different age groups or cultures. Learn about legislation covering children and vulnerable adults (it differs across the UK) and how it affects safeguarding policies in your organisation. Trust your intuition. When something does not feel right, gather the relevant information and discuss your concerns with a senior staff member. Nurses have a professional duty to report concerns about actual or potential safety of patients or public. Read and reflect on the NMC booklet, Raising Concerns: Guidance for Nurses and Midwives, which outlines nursing students’ responsibilities. Throughout your career you will encounter people from all walks of life. You will have to find a balance between being non-judgemental and remaining alert to potential risk or harm. Taking the time throughout your training to reflect on managing challenging safety situations will help equip you with the skills to practise according to the Code.